Today I realised that I wouldn't have enough fabric left to complete my mother and father's wall-hanging. Not the best realisation to have on 18th December, but luckily Oakshott kindly agreed to speed some supplies to me and I'm hoping I'll be able to continue with my sewing marathon at some point tomorrow. Once I'd finished hyperventilating, I realised that made today an unexpected free day when I could try to get some of the jobs done which have been piling up while I've been hand-sewing (seemingly at a snail's pace). At the end of November my husband put our names in a hat and we all picked one out. We decided that each of us would hand-make one gift for whoever's name we drew and who we were making for would remain a secret until the gift was unwrapped on Christmas Eve. Unfortunately my little boy is the worst secret-keeper I've ever met and he couldn't stop grinning when he picked a name out of the hat and eventually said: I'm just going to burst if I can't tell him I've got him! (as there's only one other 'him' in the family, my husband is now very much looking forward to seeing what he's been made without quite the same element of surprise he'd been hoping for). I drew my daughter's name and it's been playing on my mind that it's nearly Christmas and I still haven't made anything for her. So today I ran up a dress for her bear. In the summer her bear seems to wear this dress and in the winter it's normally woollens (this change in uniform is done without ceremony or comment, but clearly my daughter is keeping tabs on Bear's likely body temperature), however, I thought she may like something more formal to wear on Christmas day. My daughter has never played with dolls, but I noticed recently as I scrolled through my photos en masse in Picasa that without my really being aware of the bear ever being carried around or brought along, the bear appears near my daughter in nearly every indoor photo I've ever taken of her. She is just there - she is not a creature who has been given a large personality that demands attention - in fact she is very much like my daughter (and her cat, who also seems to mostly appear near my daughter): quiet, unassuming and just very sweet. I had been going to make a Liberty print dress in a vein similar to that of the yellow sundress I made last year, but at the last minute I decided that the dress should be more stylish and modern looking. So Bear wears a dress made from a small part of an Art Gallery Fabrics stack of solids that I was given when I met with Pat Bravo earlier in the year. 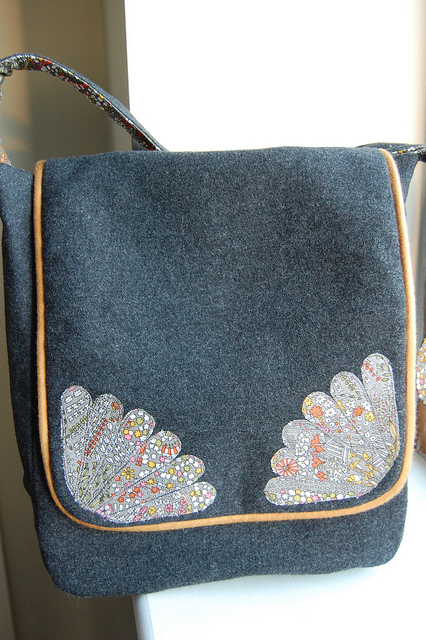 They were lovely to sew with: crisp, supple and with barely any fray - perfect for small pieces. The top half of the dress is fully lined to dispense with any need for binding at the neck and arms. It's been a while since I lined a dress bodice so I referred to Amanda's excellent tutorial intended for garments worn by humans, but just as useful for bear attire. The pattern is my own. In the last week or so I've been feeling increasingly eager to get back to some (full size) dressmaking, not least because I haven't been able to find in the shops either the dress or the skirt that I'd like to be wearing. This miniature has only made the yearning stronger. But there is a wall hanging to be finished first and then a great many other things to be done first. How are your own Christmas plans coming along? Christmas is only eleven days away and I am quite a long way from finishing the paper pieced wall hanging that I'm sewing for my parents. However, I have at least finished the first inner round. As ever, the Oakshott shot cottons delight me - while the colours appear quite flat and deadened when viewed straight on, as in the photo above, when you approach it from any other angle it suddenly leaps into life and makes the design look multi-faceted in an extraordinarily three-dimensional way. I collected the frame that I've had made for it this morning, which is only making me want to stitch faster so that I can get it safely set inside. There's an undercurrent of worry that accompanies its construction until I know that it will definitely look right and sit nicely behind the glass and I've been mentally sorting through possibilities for panic purchases that I can make if it doesn't end up happening. To everyone else this is a wall hanging, but for me it feels as though it has the potential to sprout paws and turn into an unwanted Red Setter dog (possibly the thing that would most horrify my mother were I to present it to her on Christmas day) if it doesn't turn out quite as I'd been hoping. The reality of handing over a creature that takes up 36" of wall space in somebody else's home that they hadn't asked for is now weighing rather heavily on me. Perhaps next time I will attempt postcard sized pieces as gifts. Ps. To anyone with a beloved Red Setter who may be offended by this post: the reason the focus rests on them is purely because this is actually my father's dream dog and so it has become a particularly feared breed due to the potential for it to be an unwelcome reality in my mother's life, not because she finds the actual dogs unpleasant...she just doesn't want one herself (a feeling which I can totally relate to as my own husband becomes worryingly dreamy over Labradors. We once went for a bike ride with another family and their chocolate Labrador and on our return my husband and children both confessed that they had been riding along proudly pretending he was theirs. I had been riding along feeling horrified by how it dived into every puddle and stream and then shook itself violently spraying a shower of mud over anyone foolish enough to be nearby, ran in front of the bike wheels and generally dashed about in an unrelaxing way. I think you're probably either a dog person or you're not). 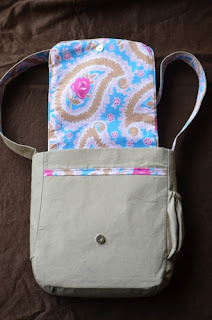 When I put my Bloomsbury bag pattern on sale I said that I'd share some photos of the bags that my pattern testers had made in a later post. And here they are. 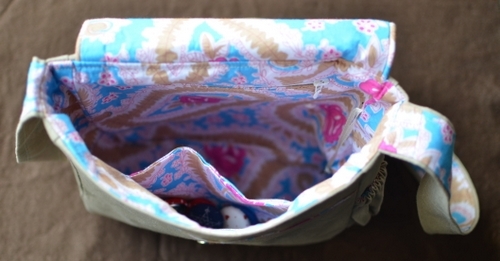 Above, is a peek inside the lovely bag made by Elisabeth from Shark's Dinner. Wonderfully, Elisabeth chose to use a pair of her husband's old suit trousers as the outer fabric. I love the contrast of the delicate Liberty print piping and Dresden petals against the masculine base fabric. You can see more on Elisabeth's blog. 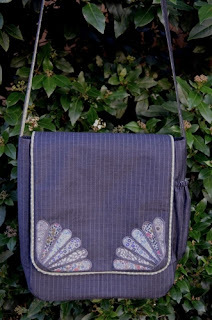 ﻿Val who write Dottie Cookie made this beautiful bag below and I have fallen in love with the print she's used for the lining, which is by Jennifer Paganelli. Val used the smaller bag pattern, which doesn't have the internal zipper pockets, but she went wild and put them in anyway. 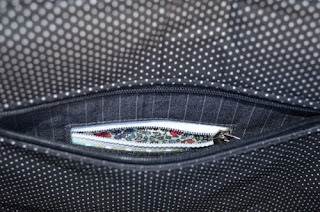 She's also put a beautiful horizontal strip of fabric across the front of the main body of the bag - I love this detail. 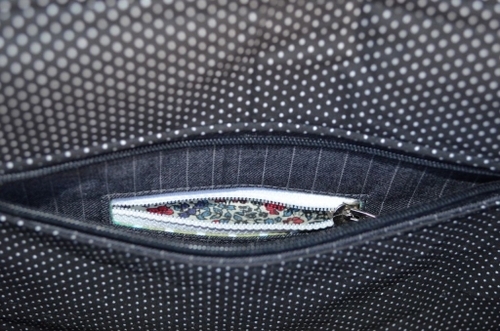 This is the inside of the bag, below. I reduce the size of photos for my blog so that the page loads quickly, but if you were able to see the full size photo you'd know that Val has a selection of beautiful fabric covered buttons in the open pocket. With extraordinary speed, seemingly the day after I'd released the pattern, this gorgeous version by Millie (writer of Needles and Haystacks) popped up in my Flickr pool. It's beautiful and apparently a version for her ten year old is to follow soon. Thank you to everyone who has bought a copy of the pattern - I'm so looking forward to seeing what you make. And while we're on the subject of patterns, I love giving these sleeping bags for bears, dolls and creatures as a gift and hoped you wouldn't mind my reminding you of them, just in case you're stumped for what you could put under the Christmas tree for a small person in your life. You can find the PDF pattern for instant download here and a post about how to deal with sizing for any awkwardly-shaped but much loved animals here. Finally, I wanted to link to a few things I've seen elsewhere recently. Firstly, I've been following Cathy's hand-sewn Museum Medallion quilt coming together on Instagram and Cathy's now put together a post featuring the same pattern made by others. It's gorgeous and I thought you may enjoy seeing it too. Dragonfly Fabrics have added some new Christmas bundles to the shop featuring the Kitzbuehel fabrics I'd mentioned in my giveaway post (closed), so they're now available as affordable sets if you're interested in them. Finally, I've been looking at handmade gifts on Folksy and happened to come across this beautifully designed t-shirt, loosely based on the traditional Tunnock's Teacakes design. I'm considering buying it for my husband, as it's entitled Mr Teacake. It is, I think, no secret that my blog name isn't quite what I would have chosen had I put more thought into it when I signed up on blogger nearly six years ago - it had never occurred to me that people would end up calling me by my blog name (I am very much a Florence, not a Flossie - the blog title refers to a favourite childhood book). However, my husband finds this highly amusing and has taken to bellowing 'Teacakes!' through the house when he needs something as though he is mid-game on a rugby pitch. Just horrid (although it does make me laugh in a slightly frustrated way). Whilst I normally veer away from giving punishments* as Christmas gifts, I'm very tempted to buy one for him. But then again, one must at least attempt to rein in ones propensity for acting in the manner of Roald Dahl's Mr and Mrs Twit, no? * I've realised he wouldn't see this as a punishment at all though - he would probably wear it with pride. I've tried so many ways to make this block that aren't English paper pieced - I've sewn it by hand with a running stitch, I've tried using freezer paper to mark the shapes and then sewing it on the machine and I've tried foundation paper piecing. But all of them have lead me back to English paper piecing. Although first they led me to the sewing machine repair shop having broken it during one of the machine-based attempts. Luckily, despite saying it wouldn't be until next week when I rang up to book it in, I think the repair shop sensed that they were dealing with an addict who may fall on the floor and weep if she didn't have a working sewing machine in her room and fixed it there and then (in my defense I said NOTHING to communicate that, so it must have been an aura of despair I was exuding). Amusingly, when my family came to meet me outside the sewing machine shop (having been on their own emergency trip to buy a Christmas stollen) they were laughing as they saw me holding the machine's case in the distance. They actually thought that I was so traumatised by the idea of leaving my machine there that I'd had to bring the empty case home with me like a large plastic comfort blanket. But no, I had a working machine inside it! However, during my brief time in the shop they introduced me to what might be my next machine. I adore my mechanical, which is so sturdy and reliable (the breakage was just some thread that had become trapped in an inaccessible place due to my doing something ridiculous while I was sewing), however, I often spend days on end working at my machine for several hours at a time and the idea of an automatic thread cutter and other conveniences is starting to have a great appeal! It feels slightly like I'm still using a typewriter when the rest of the world has discovered the wonder of the computer. There's an old-fashioned charm about it, but ultimately, it's tiring. But anyway, these star-centred flowers are sewn entirely by hand and the decision to use English paper piecing now feels like the right one. Having made samples using virtually every different way that one might attempt to create the tiniest blocks (I've placed a £1 coin on the one above to show you the scale), the neatness and simplicity offered by English paper piecing feels refreshing, and my love for the method is renewed, even though those tiny whip stitches are so time consuming. I've three more of the tiny blocks to make and then it's on to the edges. The blue Oakshotts shot with black are lovely - just like the rubies, their shade changes depending on what angle you look at them from and enjoying this level of eye-entertainment while I sew makes me worry as to how I'll cope when I return to working with regular cottons after this project. I'll be craving some interesting patterns. Have you seen any new fabric ranges that you've fallen in love with recently? I have my eye on French General's Chateau Rouge and La Belle Fleur (which is due to be released in January). Now that I've found a method of construction that I'm happy with my mind is turning to a frame, which I'll need to have made before it's completed if it's to be ready in time to give to my parents for Christmas. I adore the walnut frame I had made for the rubies, but I'm pondering over mirrored glass for the blues, although I don't remember seeing anything like that at the frame shop. My memory of the silver-hued frame department was a range that looked more like they'd been spray-painted to that colour, which appeals less. I wonder if next time I ought to buy the frame and then work to that size, rather than the other way around. Any thoughts on frame colour? Would the walnut work?